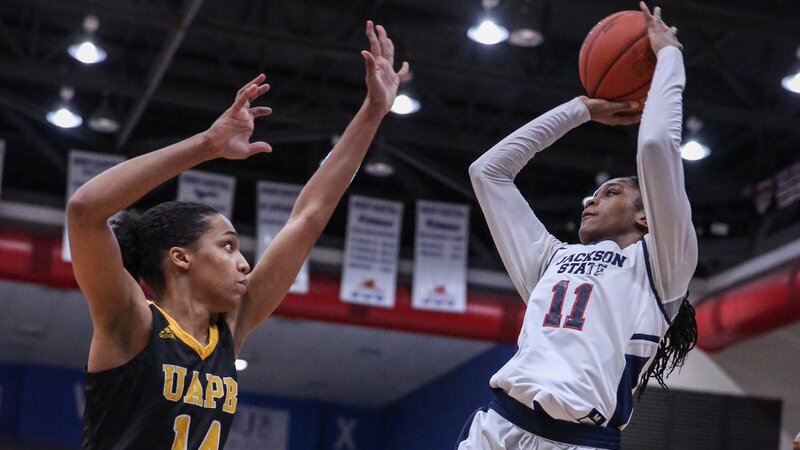 JACKSON, MS–Despite a sloppy game of turnovers and numerous missed free throw opportunities, the Jackson State women’s basketball team defeated Arkansas Pine Bluff 60-41 Monday evening in the Lee E. Williams Athletic and Assembly Center. Lady Tigers improve to 8-12 and 4-5 in conference play. Lady Lions drop to 4-12 and 1-8 in conference play. With the win, Jackson State (8-12, 4-5) earned its first three-game winning streak of the season. The Lady Tigers finished with three players in double figures. Marneisha Hamer led the Lady Tigers with 19 points and eight rebounds in 24 minutes, followed by Christina Ellis with 14 points and Sumer Williams with 13 points and six rebounds. JSU women’s basketball coach Tomekia Reed looking at her team as the Lady Tigers hosted Arkansas Pine Bluff Monday evening at the Lee. E. Williams Athletic and Assembly Center. Lady Tigers head coach Tomekia Reed said the win was “not quite the win in terms of being crisp and sharp with their play” but the team pulled it together. “One thing I told the team is that the mark of a true championship team is when you can pull wins out of sloppy play,” Reed said. Arkansas Pine Bluff (4-12, 1-8) remains at the bottom of the standings in the SWAC standings. Off the bench, Shawntayla Harris led the Lady Lions with nine points and rebounds with 12, followed by Ashlee Daniel with eight points and Atitiana Vincent with seven points. As a team, UAPB finished the game shooting 32.7 percent off 17-of-52 shooting from the floor. Although the Lady Tigers earned the victory, JSU finished with 20 turnovers – two less than UAPB – and shot only 53.1 percent (17-of-32) from the free throw line, mainly from its leading scorer in Hamer who went 7-of-13 from the charity stripe. Defense and rebounds on both sides of the ball helped Jackson State down the stretch. The Lady Tigers outrebounded the Lady Lions 45-32 and earned more steals (17-12) that helped them get 22 points off turnovers. In the final period, the Lady Tigers kept their defense strong and knocked down their second-best percentage of free throws in the game, shooting 75 percent (6-of-8 shooting) from the charity stripe to put away the Lady Lions. After halftime, the Lady Lions nearly doubled their points in the third quarter than they had in the first half alone but it still would not be enough, despite shooting slightly better than the Lady Tigers from the floor at 40 percent off 6-of-15 shooting. Lady Tigers shooting 48 percent (12-of-25 shooting) from floor. Jackson State outscored the Arkansas Pine Bluff 13-7 in the second quarter and kept their energy from the first quarter as the Lady Tigers led 29-15 at halftime, shooting 48 percent (12-of-25 shooting) from the floor. UAPB shot 26.1 percent from the floor. After both teams tied the game at 4-4 with 8:09 to play in the opening quarter, the Lady Tigers went on a 10-2 run behind the play of Williams and Ellis, taking a 16-8 lead heading into the second quarter. With three straight wins, Willams believes everything is starting to click for her and her teammates. “We starting to learn each other better as teammates,” Williams said. Jackson State returns to action on Saturday as the Lady Tigers go on the road to play Alcorn State in Lorman, Mississippi. Tipoff is set for 3 p.m.